In less than 12 months, the United Kingdom will leave the EU. One of the hardest issues to solve is how to handle the border between Northern Ireland and the Republic of Ireland. Border shop employees are particularly worried about what's going to happen with their jobs. Apr 16 2018 (IPS) - In a bus sits a man wearing a chequered shirt and cap. His age is difficult to determine. He could be 45, 55 or 65 years old; life treats us so differently. He puts on his jacket. Gets ready to step off and say goodbye, but suddenly halts and points to a marketplace. ”That’s where the bomb hit,” he says sharply. On August 15, 1998, the small rural town of Omagh became the site of one of the bloodiest terrorist attacks of the Northern Ireland conflict. Twenty-nine people died in a bomb attack by an IRA breakaway group. • In 1922, Ireland, which until then haf belonged to Britain, was divided. In the south, where most Catholics live, the state of Ireland was formed, while Protestant Northern Ireland remained a part of Britain. • In the late 1960s, tensions grew and a civil rights movement demanded equal rights for Catholics in Northern Ireland. The clashes turned violent and the period between 1969 and 2007 became known as The Troubles, when paramilitary groups such as the IRA, which wanted a united Ireland, and the Protestant Ulster Volunteer Force, fought each other. • More than 3,500 people died in the conflict and nearly 50,000 were wounded. In 1998, an agreement was reached between Britain and Ireland, who agreed to establish a degree of self-governance in Northern Ireland and to reduce tensions between different groups. Since then, the violence has decreased. The terrorist attack put pressure on militant groups as calls for peace came from all over the world. That’s now 20 years ago, but those who lived through it remember. As soon as the uncertainty about what will happen when the UK leaves the EU is mentioned, many of those that Arbetet Global speaks with say: ”I hope the clock will not be wound back”. The man puts his hand out in a greeting. ”I was not in town when it happened,” he says, stepping off the bus. The border issue has once again become a hot topic in Northern Ireland. 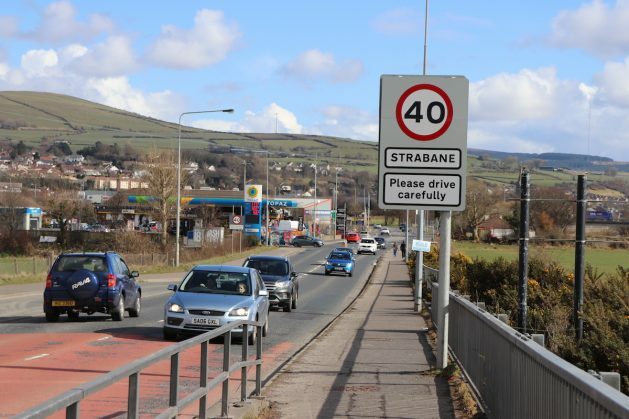 The small village of Strabane is located right on the border. The hills are equally green on both sides of the River Foyle, but on one side the speed limit road signs are in kilometres per hour, on the other in miles per hour. On one side, Ireland, on the other, Northern Ireland. ”Ten years ago, it did not look like this. We did not have all the big shops you see all around. This cafe wasn’t even here,” says Michael Lafferty. He has temporarily left his busy job as a supermarket checkout operator to grab a lunch sandwich and a cup of coffee. The grey shops around the cafe look like shopping centres mostly do. Large car parks surrounded by hangar-like buildings where food giants, furniture stores, sports chains and fast food restaurants compete for customers who are currently moving freely across the border. 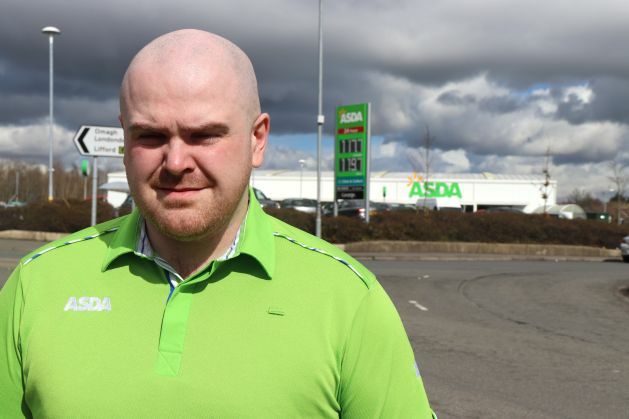 When Michael Lafferty was growing up, it was a completely different situation. “We had a British checkpoint right outside the house where I grew up,” he says. Soldiers would stop each car to ask who passengers were and where they were going. Passing the border took time. The conflict in Northern Ireland was always present. “I remember there was a guy who was shot in my little town when I was young. Then there was a bomb explosion too, but it was not that serious. It’s been a long time now,” he says. But for Michael Lafferty and most others who grew up during the Northern Ireland conflict, the memories are indelible. ”I think about half of our customers come from Ireland,” says Michael Lafferty inside the café, taking another bite of his sandwich. He is active in the nationalist party Sinn Féin, which wants to see a united Ireland and was close to IRA in the past. Sinn Féin was previously opposed to an EU membership but changed it’s mind many years ago when it realised EU membership could be a way to create a united Ireland. Both Britain and Ireland have been clear about wanting a ‘soft border’ – without constant border controls – but the big question is how such an agreement will look. Michael Lafferty says he believes that the British exit will have effects. ”We will suffer hard. Everyone will,” he says. • Autumn 2018: The EU and Britain hope to agree on a UK exit agreement that can be approved by the Member States and the European Parliament. • March 29, 2019: Britain leaves the EU. • 20-21 June: Heads of State and Governments of the Member States will hold a summit in Brussels hoping to agree on a new President of the European Commission and other important posts. The European Parliament is expected to approve the next Commission President. • Autumn 2019: The new EU Commission, as well as a new Permanent Council Chairman, will take office. • 31 December 2020: Transition period for Britain’s EU exit expires. • January 1, 2021: The EU’s next long-term budget come into force. At the other end of the political spectrum is DUP – the Democratic Unionist Party. Protestants who, at all cost, wants Northern Ireland to belong to United Kingdom. The party, which is in government, together with Conservative Tories, has strongly proclaimed that DUP cannot participate in any British government that accepts special arrangements for Northern Ireland. It would be a step towards a united Ireland that they absolutely do not want. In Belfast, the Protestant neighbourhoods lie side by side with the Catholic. A ‘peace wall’ of barbed wire and steel doors separate the two sides of the city from each other. Murals across the city depict automatic weapons, fighting women and men, falling heroes and tributes to paramilitary organisations on both sides. 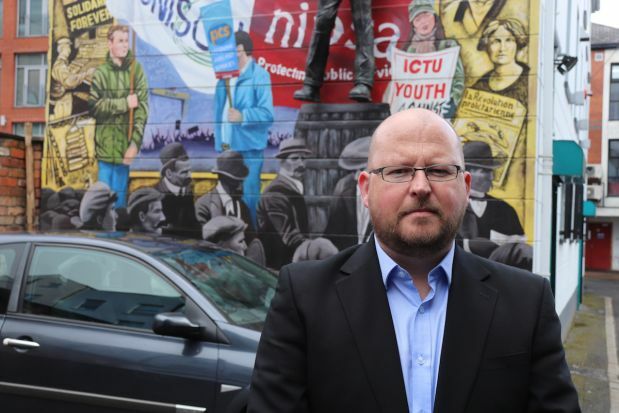 When Arbetet Global meets Owen Reidy – Assistant Secretary General of the Irish Congress of Trade Unions – the mural is the first thing he brings up. In the courtyard behind the union’s centre in central Belfast, a colourful painting that includes the names of 30 unions covers the short side of a house. The Irish Congress of Trade Unions organises federations in both Ireland and Northern Ireland and during the Brexit poll, there was no doubt as to what the organisation would choose. ”We wanted Britain to stay in the EU,” says Owen Reidy. But that didn’t happen. Now, the trade unions are struggling to avoid a deterioration of labour conditions for employees. A concern is that the Conservative Government of Britain will increase flexibility to strengthen its competitiveness vis-à-vis the EU. The Conservative Government has said that an advantage of leaving the EU is that it can remove rules that make it more expensive for businesses. The union fears, for example, that companies can get more power to set working hours whenever they want. The trade union is also worried that the commerce will be damaged, which means that jobs are at risk of being lost and wages could be pressed down. ”It’s a crazy process. The British do not seem to know what they want in the negotiations. The positions are constantly changing. It says one thing one day and something else next. Owen Reidy says that he often meets companies saying they want to invest but are hesitant because they don’t know what will happen. The big question is whether it will be a hard or soft Brexit. Will there be border controls and customs or customs union or an agreement in which freedom of movement remains in some form? But Owen Reidy fears that even minor changes could have major consequences. Trade and free movement across borders has been a way of creating peace. Villages on both sides have been merged. There are people crossing the border four to five times a day. They trade, socialise and play sports, but if the border becomes visible again, he is worried that it will have psychological effects – that people think the progress is going backwards.